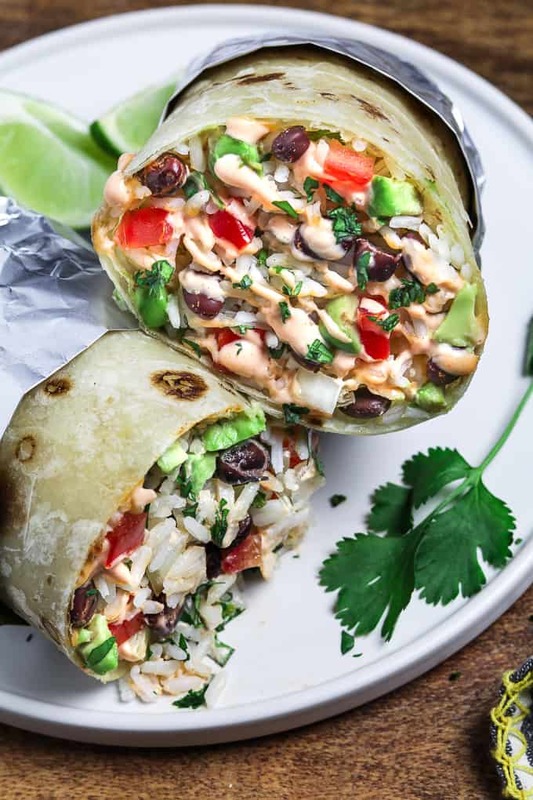 The Ultimate Vegan Burrito – the perfect meatless meal! 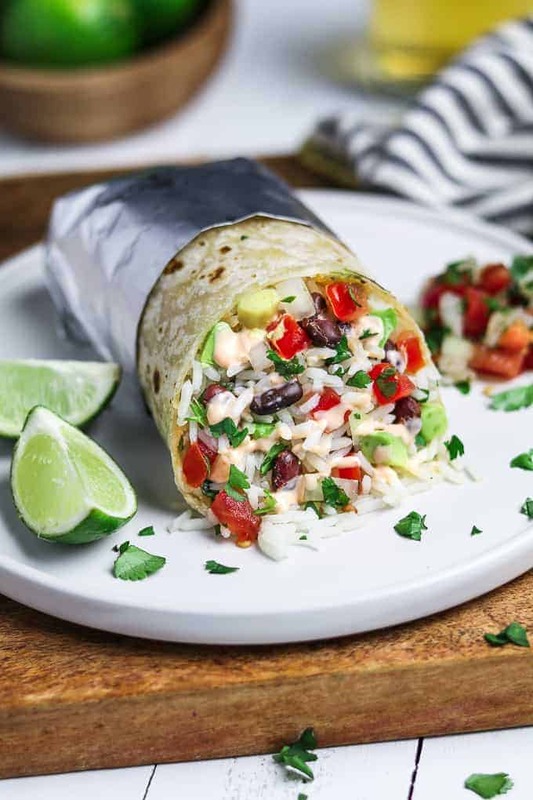 Loaded with chipotle black beans, cilantro-lime rice, pico de gallo, avocado, and spicy sauce. They are packed with flavor and will be on your table in no time! What’s not to love about a hand-held meal? Burritos are my favorite go-to recipe when I want something, fast, easy and really satisfying! What’s in a Vegan Burrito? 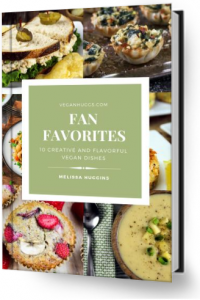 Filling ideas: Vegan Cheese Shreds, Jackfruit Carnitas, Roasted Potatoes, Sautéed Peppers & Onions, Corn, Chunky Salsa, Jalapeños, Vegan Chorizo, Shredded Lettuce or Vegan Nacho Cheese. Cilantro Lime Rice – cook long grain rice according to package directions. When done, remove from heat and fluff with a fork. Now add lime juice and cilantro and gently stir to combine well. Taste for seasoning and add more if needed. Cover with lid to keep warm. Chipotle & Lime Black Beans – In a medium skillet over medium heat, add the beans, chipotle peppers and adobo sauce. Bring to a slight simmer to heat throughout, about 2-3 minutes. Remove from heat and stir in lime and salt to taste. Keep covered. Pico De Gallo– combine diced tomatoes, onions, cilantro, lime juice and salt in a medium bowl. Taste and adjust flavors if needed. You can use a store-bought variety or replace with diced tomatoes if you don’t like raw onions. Spicy Sauce – combine 1/2 cup Vegan Sour Cream or Vegan Mayo with a few dashes of your favorite hot sauce. I used Cholula. Now the fun part! Wrapping a burrito is actually quite easy once you get the hang of it. It’s ideal to use a large tortilla so you have enough room to wrap tightly. Also, I always warm them up to make them soft and pliable. You don’t want to overstuff the burrito or it will fall apart. Place warmed tortilla on a flat surface and add your filling in the middle. Fold the sides in, then tuck in the top flap under the filling as you roll. Continue to roll tightly until complete (see video for visual instructions). If you make this vegan Burrito, let me know what you think by ★ star rating it and leaving a comment below. It would really make my day. You can also follow me on Instagram and share your creation with me. Just tag me @veganhuggs and hashtag #veganhuggs so I don’t miss it. 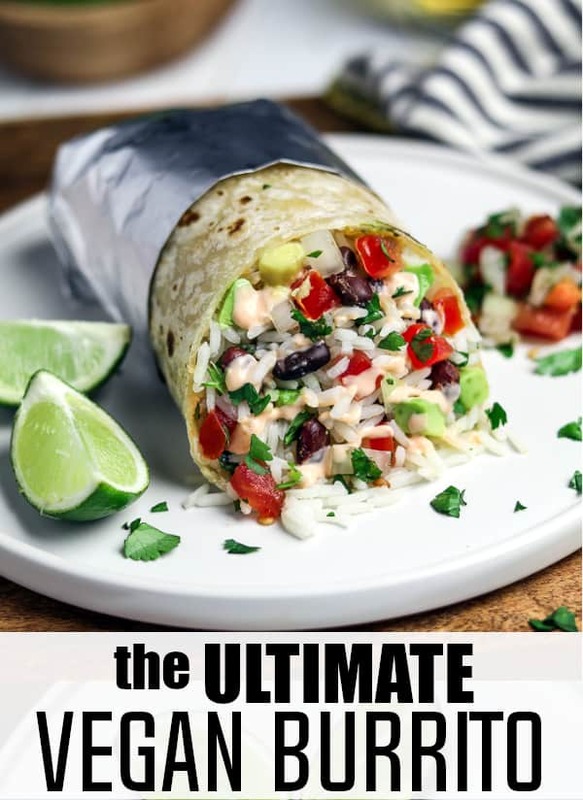 The Ulitmate Vegan Burrito – the perfect meatless meal! 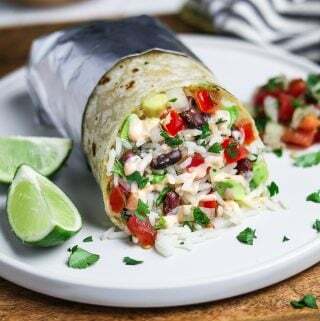 Loaded with chipotle black beans, cilantro-lime rice, pico de gallo, avocado, and spicy sauce. They are packed with flavor and will be on your table in no time! After the rice is cooked, remove from heat and fluff with a fork. Add lime juice and cilantro and gently stir to combine well. Taste for seasoning and add more if needed. Cover with lid to keep warm. In a medium skillet over medium heat, add the beans, chipotle peppers and adobo sauce. Bring to a slight simmer to heat throughout, about 2-3 minutes. Remove from heat and stir in lime and salt to taste. Keep covered. In a medium bowl, combine all ingredients well. Taste and adjust flavors if needed. Set aside. Warm a tortilla in a large skillet over medium heat, about 15-20 seconds on each side. Place on a flat surface and add your filling in the middle (don't overfill). Fold the sides in then tuck in the top flap under the filling as you roll. Continue to roll tightly until complete (see video for visual instructions). Kid-friendly- omit the chipotle peppers in adobo sauce. You can replace it with 2 tablespoons of vegetable broth, 1/2 teaspoon each of smoked paprika, cumin, granulated garlic, and, granulated onion. Add salt to taste. These were ah-mazing!!! Such flavor! Thank you for the recipe! I love your recipes! Always delicious! I’m thinking grilled young asparagus spears to substitute for the avocado, but then my mind completely jumped the shark and thought, “roasted sweet potato”? Huh? Hmm…that could be interesting, though! How well do you think they’d freeze? Furthermore, how well do you think they’d reheat in a microwave? Hi Dave! Yum, grilled asparagus sounds like the perfect replacement for avocado. Roasted sweet potato sounds amazing too though! So many decisions! These are yummy!!! 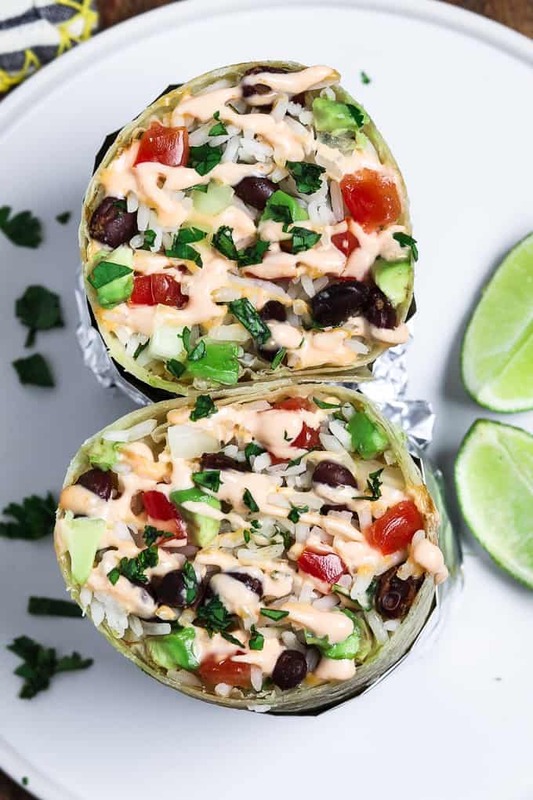 The cilantro rice and beans were perfect in these burritos. Quick and easy recipe that my whole family loved. Thank you for the great recipe. Awesome! Thanks! Just finished eating them. This looks delicious! It’s on my dinner menu for tonight. I have everything to make this! Thabks for the dinner idea.